New to the Rental Market, Beautiful End Unit Incredible Views PRIVATE SAUNA! Brand Spanking NEW To The Rental Market EVER! Moose Hollow 1301 - aka: "The Crown Jewel"
All The Way To Snowbasin! "You Absolutely Won't Believe This View!" * All high-end furnishings - comfortable, cleaned professionally after every visit by Prestige Cleaning Service (they are amazing!) and help make for an incredibly relaxing condo unit. The entire SOUTH SIDE of this unit has nothing but windows looking out, a across the valley, the lake and Snowbasin - major advantage to being an end unit. Quiet unit too, no common wall neighbors! * Unique Amenity: The owners converted installed a cedar lined sauna! * This is an amazing nearly new one of a kind Moose Hollow condo. Beautifully decorated, Looks and feels like a model home, yet incredibly comfortable with leather sofas, Smart TV's, even top of the line beds, mattresses and linens, towels, etc. * Spectacular mountain views from the front balcony, windows and back patio! * Make this your home away from home at the beautiful Wolf Creek Resort. There is also free high speed WIFI internet service and access to 2 hot tubs nearby. 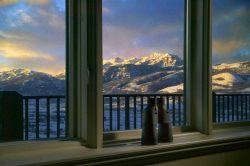 This beautiful condo is located minutes from Powder Mountain ski resort, Snowbasin ski resort and Nordic Valley ski resort. This is a skier's dream. The shuttle stop for easy transportation to powder mountain is literally steps from the unit. * Samsung flat screen, HD TV's with Dish Satellite Network throughout unit. First impression "Amazing" We walked in and enjoyed the design of the home immediately, our days and nights were blessed with watching great views and early morning sunrises off the porch. This location has great access to many of the activities we enjoy. Thank you for the memories!